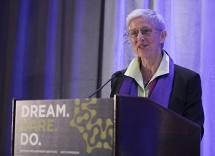 Philanthropist, social entrepreneur, field builder, and the “Janie Appleseed” of women’s philanthropy Tracy Gary of the Bay area today received the Shaw-Hardy Taylor Achievement Award from the Women’s Philanthropy Institute (WPI) at the Indiana University Lilly Family School of Philanthropy. The Shaw-Hardy Taylor Achievement Award recognizes philanthropists, nonprofit leaders, volunteers, change agents, fundraisers and researchers who have moved women’s philanthropy forward and have demonstrated significant impact on the field. The award was presented today during WPI’s symposium, DREAM. DARE. DO. in Chicago. Gary has been at the center of developments in women’s philanthropy and the broader philanthropic landscape for four decades. She helped start the Women’s Foundation of California in 1979-1980, one of the first locally based women’s funds in the country; and several donor networks including the Women’s Funding Network, Women Donors Network, and Women Moving Millions. Gary has been a staunch leader of the donor education field and created her first of 23 nonprofits, Resourceful Women, to teach women about money and philanthropy. Seeking to reach a broad and diverse audience, Gary published the first edition of Inspired Philanthropy in 1998. Now in its third edition, Inspired Philanthropy continues to be a principal resource to help people think intentionally and strategically about their charitable giving. Throughout her career, Gary has helped inheritors think intentionally and strategically about philanthropy. An inheritor herself, Gary is related to the Pillsbury family through her mother and to GTE through her stepfather. She inherited about $1.3 million at the age of 21 and learned early on that the inheritance came with obligations. Her mother told her to volunteer and to give away 10 percent of what she earned. She has exceeded those expectations exponentially and helped build the field of women’s philanthropy in the process.